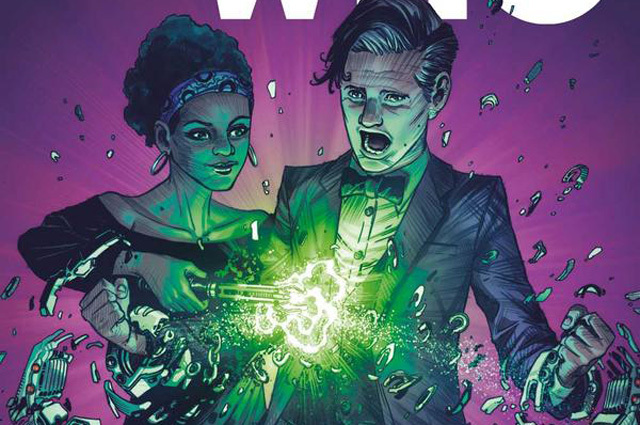 Titan Comics: Doctor Who - THE ELEVENTH DOCTOR #2.3 Review | Warped Factor - Words in the Key of Geek. Tony Fyler stands around kicking a door. Seems to be the thing to do. In the saga of the Eleventh Doctor and the crimes against the Overcast in his past, this is an odd issue. Firstly, it’s almost entirely delivered through dialogue – indeed, mostly monologue as far as the Doctor himself is concerned. Secondly, there are two simple scenarios involved – a door that won’t open, and to which Alice and the mysterious Squire (reputed, though largely by herself, to be an old companion of the War Doctor’s) keep returning, no matter how far away from it they wander in the Tardis’ architecture (it’s a temperamental time machine, it does that kind of thing), and there’s the Doctor, for the most part sitting in an illuminated chair surrounded by shadowed accusers, gibbering about his past, and he won’t – or, more worryingly, can’t – remember the bits of it they want him to recall. In essence then, it’s not what you’d immediately think of as high-octane, rip-roaring comic-book entertainment. Unless you count Abslom Daak (and we advise that you really, really should). He does plenty of ripping and roaring in this issue – and indeed in life, generally. Doesn’t get him especially far here, but damn, he looks good doing it. Writer Si Spurrier doesn’t make this a filler issue exactly, because in the quiet in between Daak outbursts, there are significant advances made, but if you’re looking for the aforementioned high-octane stuff, this is not the issue you’re looking for. Significant advances? Well, yes – we learn a little more of the history behind the Doctor’s involvement with the Overcast, and in particular his part, or non-part, in the defeat and disappearance of the Cyclors – an advanced species who the Overcast considered to be their gods, and, in whose absence a kind of plague-creature called the Malignant (they’re big on simplistic descriptions, this lot) has been picking them off relentlessly ever since, and will inevitably, in the end, destroy their species. Turns out that firstly, the Cyclors were not quite the benevolent ultra-dudes that long absence and cultural memory makes them out to be – they sided with the Daleks in the Time War, which is never going to be a good thing to have on your species-resume. Turns out also that the Doctor probably wasn’t responsible for their going ‘blip’ and disappearing from the universe. He simply, to use his words, ‘took the win.’ And then there’s the most chilling revelation here, which it would be a shame to spoil for you. Suffice it to say that more might be going on than annnnnyone much understands as yet. Meanwhile, back behind the unopenable door, there’s a good deal of inexplicable memory-invasion going on – when the Tardis lights go green, either Alice, or the Squire, or Abslom ‘My Other Chainsword Is Also In The Hand Of A Certifiable Maniac’ Daak have semi-psychotic episodes, remembering, or imagining, scenes of horror, things they simply can’t escape, no matter how hard they try. In Daak’s case, that’s a great excuse to re-draw some of the original artwork of him finding his wife dead, which you have to really seen as a child to get the most out of now. While we’re on that, let’s talk art and colour, because, damn! Simon Fraser’s your artist for this episode, with Gary Caldwell on colourist duties. There are no fewer than a very fitting eleven kickass full-page illustrations in this issue, any one of which could be a poster, but three or four of which you’d sell a kidney for in poster form. Two of those are of Abslom Daak (we did say he looks very good doing his thing here), but there’s a phenomenal page of the Squire’s memory’s, an almost movie-poster quality Eleventh Doctor with War Doctor memories overshadowing him and one gorgeous conceptual piece with the Eleventh Doctor sitting alone in a dark, red-lit Tardis, questioning his conviction that he’s always left things better than he found them. There are ten Tardis-shaped cut outs in that picture, each with an angle on one of the official Doctors that preceded him. It’s a phenomenal assessment of the Doctor’s character, as none of them can look him in the eye as he asks the question. If you’re making posters, I’ll have that one please. So it seems likely that the next issue will see more in the way of momentum and forward motion – even if that forward motion takes us, as this one pretty much promises, into the war and into a memory. Buckle up, Who-fans, things look set to get all timey-wimey.